Webroot SecureAnywhere Business - Endpoint Protection offers a revolutionary approach to malware protection. It b rings together Webroot's innovative file pattern and predictive behavior recognition technology, with the almost limitless power of cloud computing, to stop known threats and prevent unknown zero-day attacks more effectively than anything else. 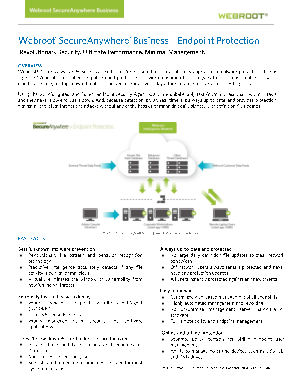 Read this white paper to learn about ultimate performance and minimal management security software from Webroot.